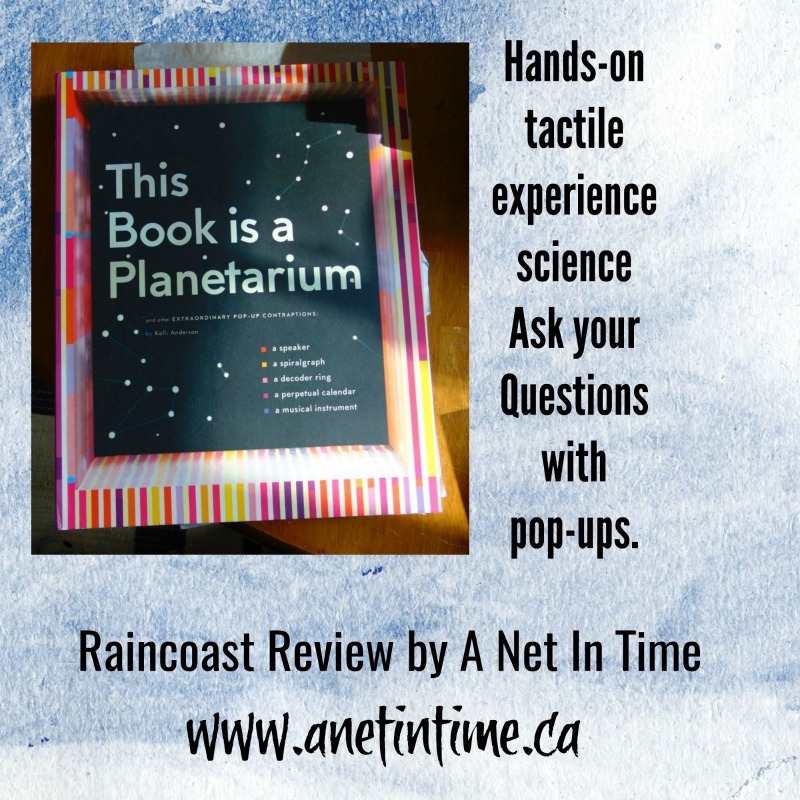 Who doesn’t like a hands-on book, a book that let’s you experience it as you read and learn? 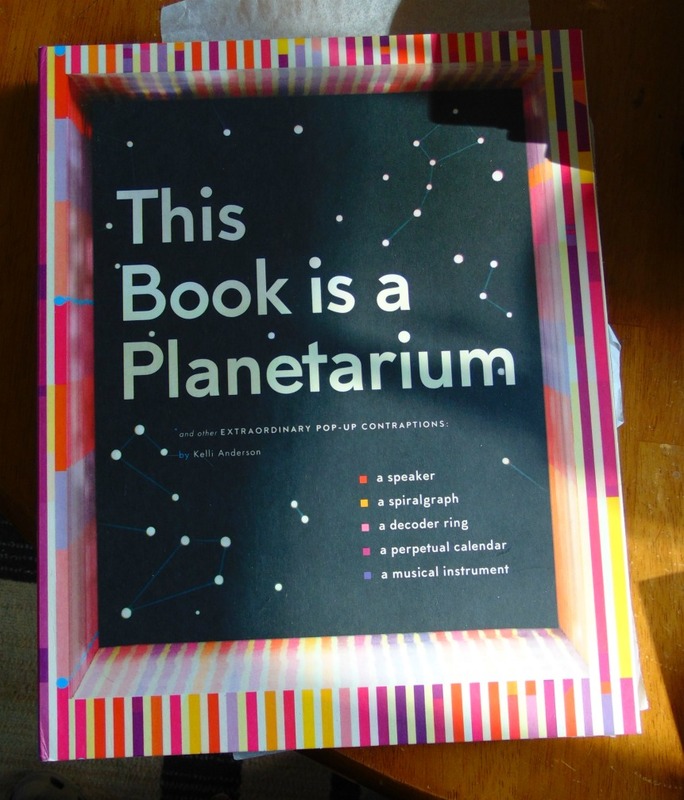 This book is a Planetarium is one such book. 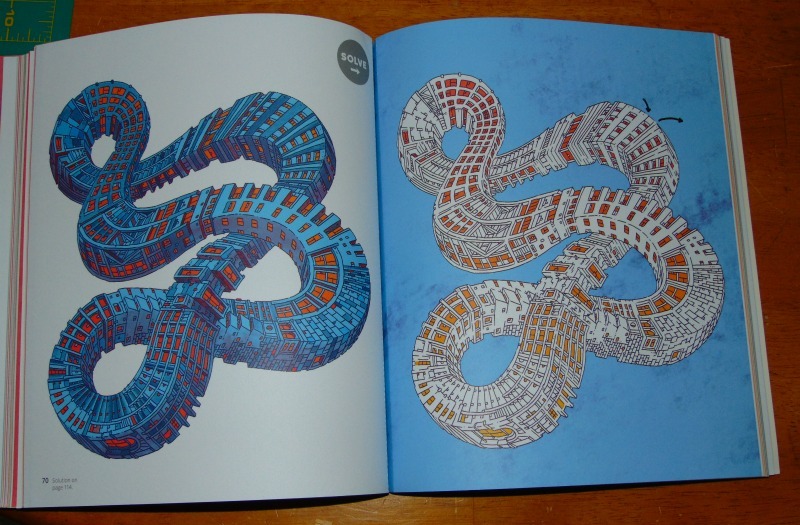 Kelli Anderson brings us a book filled with pop up’s like you have never seen before! 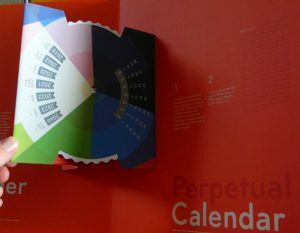 You get these pop-ups: A speaker, a planetarium,a spiralgraph, a decoder ring, a perpetual calendar and a music instrument fill the pages of this book. Heavy paper supports them, which considering their quality is an integral part of each construct. 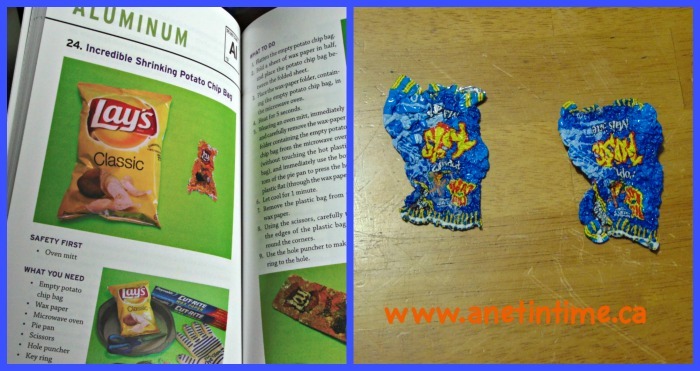 When you first open this pop-up book you will find tissue paper protecting each of the constructs. This attention to detail helps to reinforce the obvious care and concern put into making it. Defying every expectation of what a book can be, this pop-up extravaganza transforms into six fully functional tools: a real working planetarium projecting the constellations, a musical instrument complete with strings for strumming, a geometric drawing generator , an infinite calendar , a message decoder , and even a speaker that amplifies sound. Now will this book last forever? 🙂 Of course not, it’s made of heavy paper, but it is well made and if parents and their offspring use it carefully it will last for a good long while, at least as long as many of the disposable toys made now-a-days. 🙂 Uses? Oh…. varied eh? A good book to explore the senses, for studying the engineering of paper, to attempt replication, to get an introduction to making codes or to just have fun! It’s a rather neat book! Why do I like it so much? 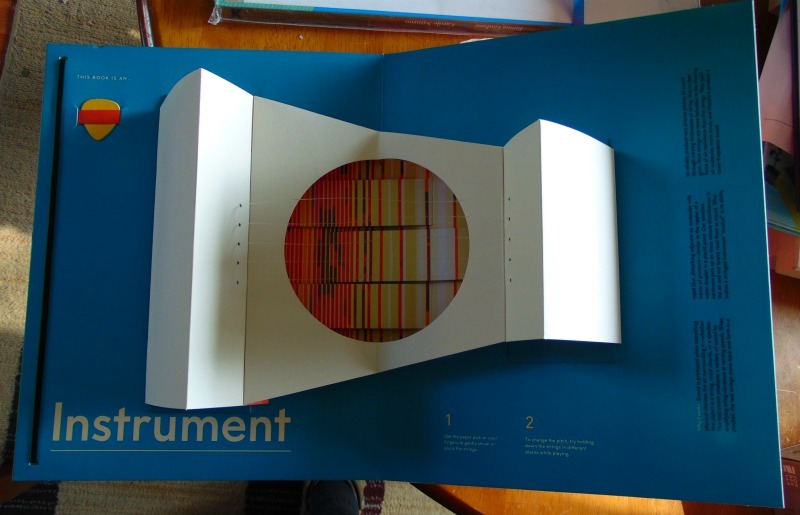 This book is meant to be a hands-on, tactile science book. A book with explanations and then “do it”. The object is to be involved in the world, doing, listening, experimenting. 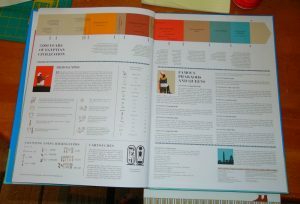 Then, as you’ve experimented with the book, to see how the book is brought to life in the physical world. It’s geared to help the reader/doer.. ask questions and want to know more. The fact that the font is smaller and in dark print helps you to focus on the learning and discovery FIRST, and then to go back after for answers. Well designed. I LOVE, just LOVE books that help people ask questions. That don’t necessarily provide ALL the answers, but enough to get the student going in the right direction. This book encourages those questions, giving the student a good place to start, and then leaving them to it. A good thing that! Where can you find it? Amazon Link. 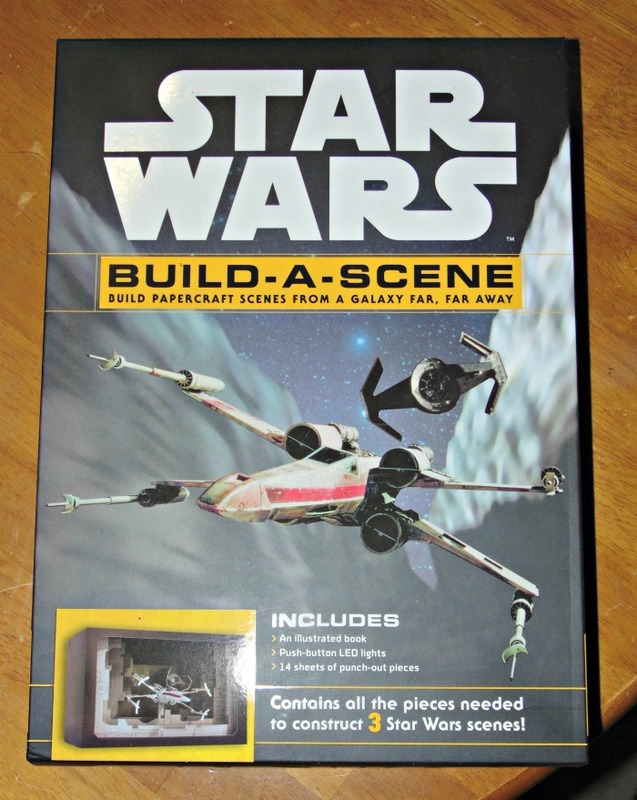 This Star Wars build-a-scene kit is perfect for the Star Wars fan in your life. My lad is an avid paper crafter and was quite delighted when this kit made it’s way into our home. 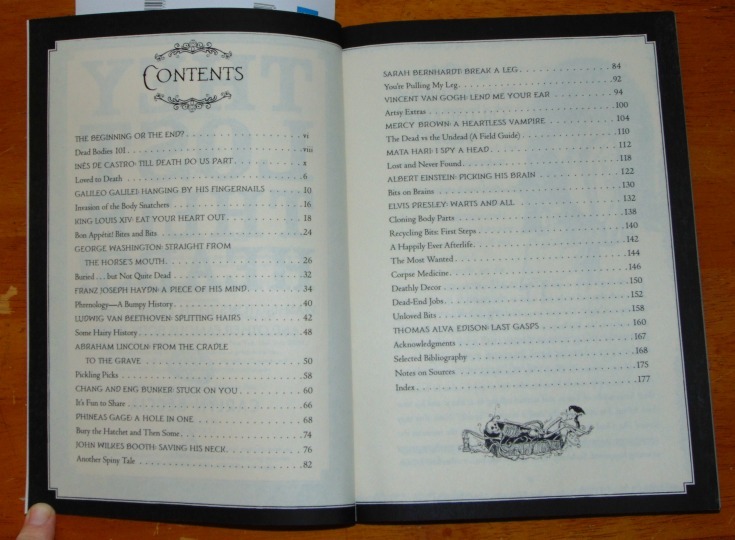 Each build in the book is predicated by a write up of what the build is about and how it was filmed. 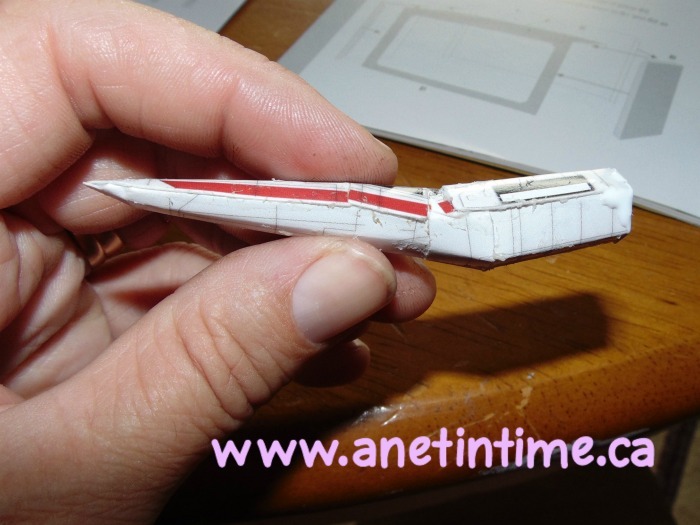 Pictures from the movie are included, as well as concept scenes making this a well-rounded kit. Not just a build but an informational kit. Once this informational write up (about 5 pages) is completed you are given a list of supplies. 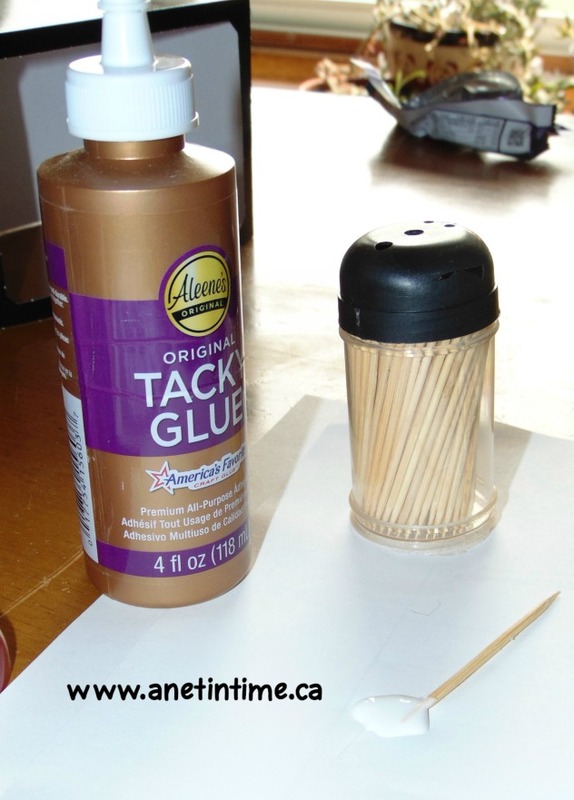 Common items like glue, paint brush, etc are listed, as well as instruction on how to do the build. Mountain and valley folds, gluing and letting dry, and so forth. The creators want you to be successful in doing the build, so take your time and read through all the instructions before starting. 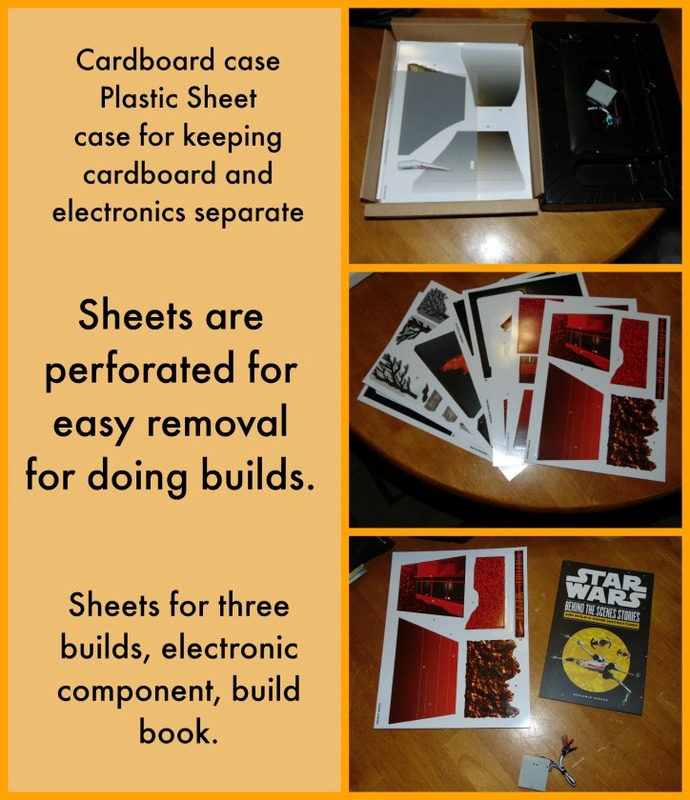 You will find that the sheets are perforated well on a thicker paper, but not board paper thick. 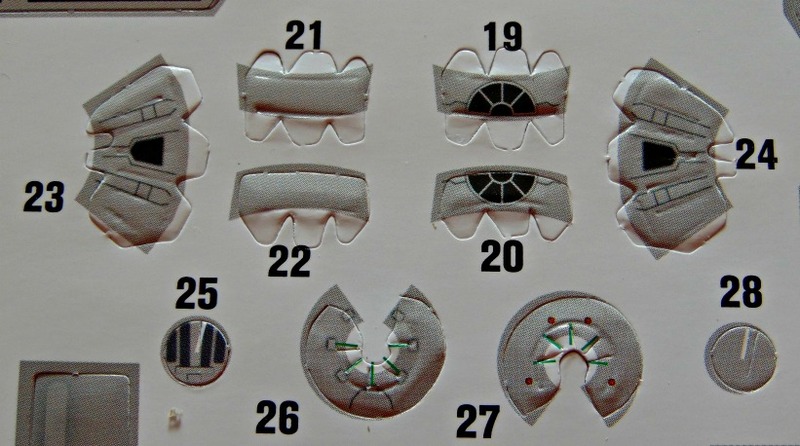 Just a nice quality paper for doing papercraft builds. The individual pieces are well numbered. Honestly.. we tried.. well.. my son tried! I started, ran into problems, he tried hard to fix my oops, and well… he lost heart. This is not a build for the inexperienced. My son is an avid paper crafter and knows how to work with glue and paper really well .. but my mess up just brought him to a stall. Unwilling he was to try another build, partially because he didn’t want to make me feel bad, but trying to fix my oops just disheartened him. Adult builders.. take heart though. 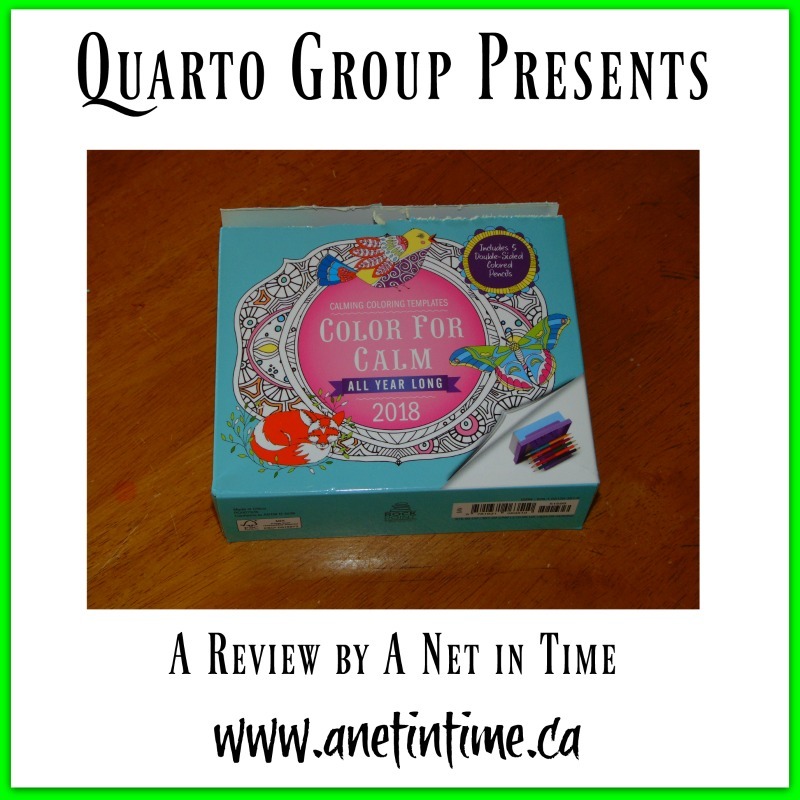 if you are a good paper crafter and have the requisite patience, this kit will work really well for you. It’s a great kit, and being able to build what you’ve seen on the big screen is wonderful. Ah… who doesn’t love the study of ancient Egypt? The study of the government, the tombs, their love of cats, mummies, and the ancient gods. 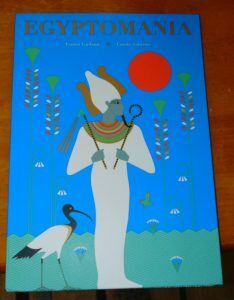 Egyptomania is wonderfully illustrated by Emma Giuliani (graphic designer and illustrator living in Paris) and written by Carole Saturno (French children’s author who also writes history and travel guides). 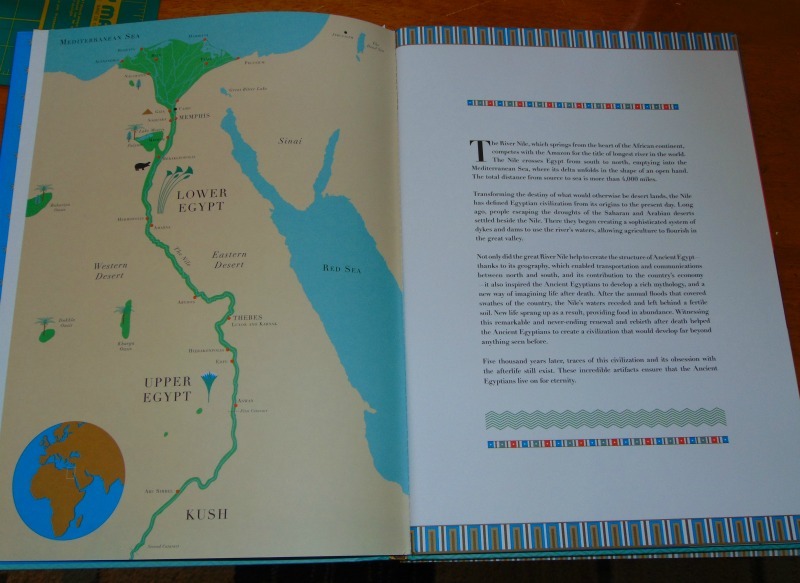 Lift the flaps and open wide pages to delve deep into the life of Ancient Egypt. Learn what Ancient Egyptians wore, what’s inside a pyramid, how a mummy is made and so much more by lifting the flaps and discovering the secrets hiding underneath! You need to check out the details in this well crafted book. 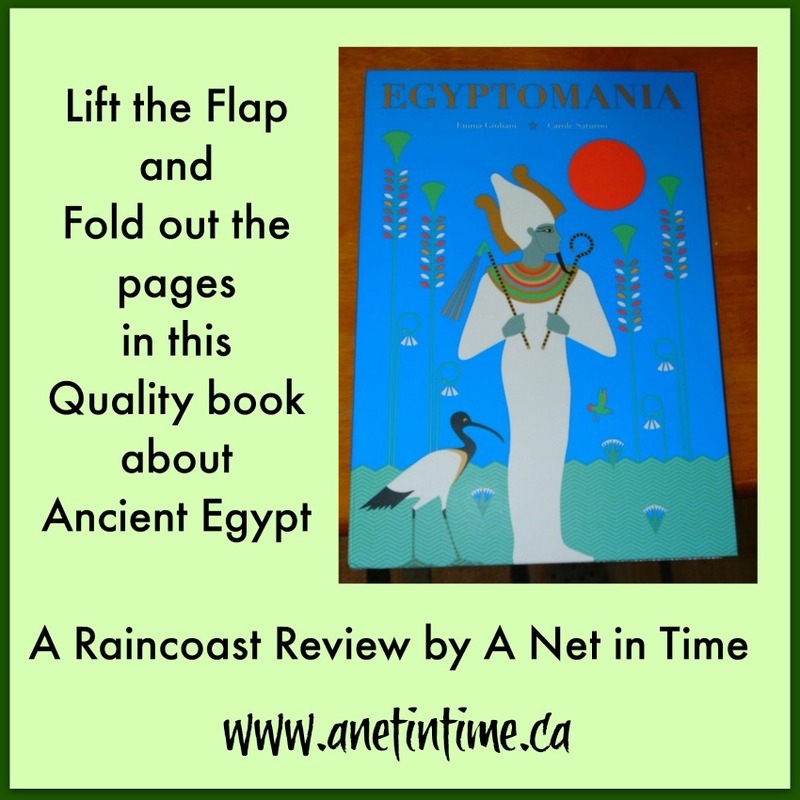 Lift the flaps to experience and learn more about Egypt and her many layers. 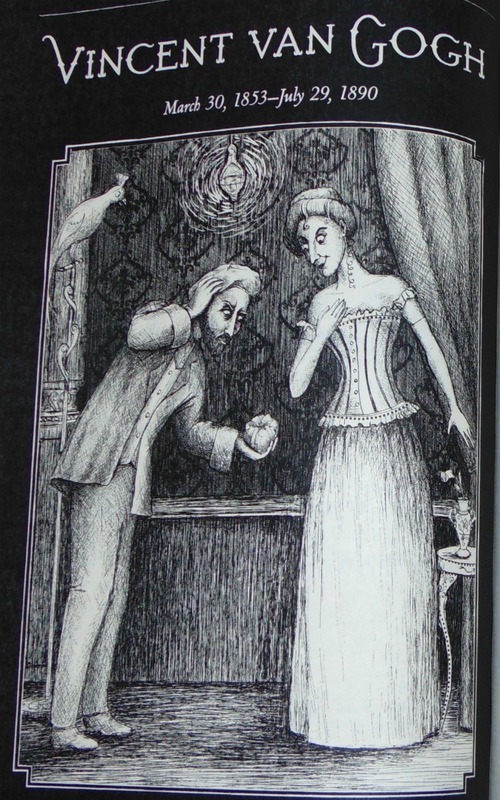 Don’t you just love the details in the illustrations? 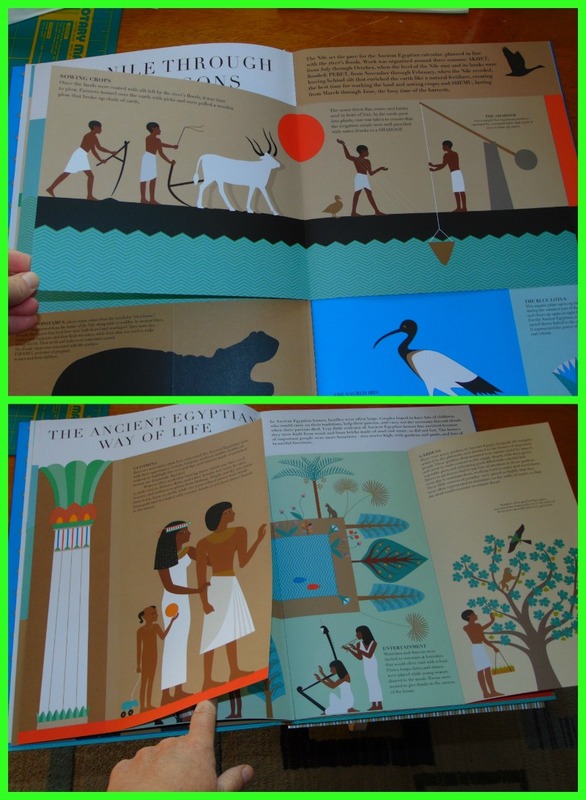 This is a well-done book that will delight any student of Ancient Egypt. I learned so much. It could easily be the start of any study of Egypt, and then use points of interest to explain your research into this culture and time. I have to admit, I like this book so much I am leaving it in it’s protective sleeve. 🙂 I just don’t want to risk it being damaged at all. 🙂 Silliness I know.. what’s the use of a good book if you keep it wrapped up? 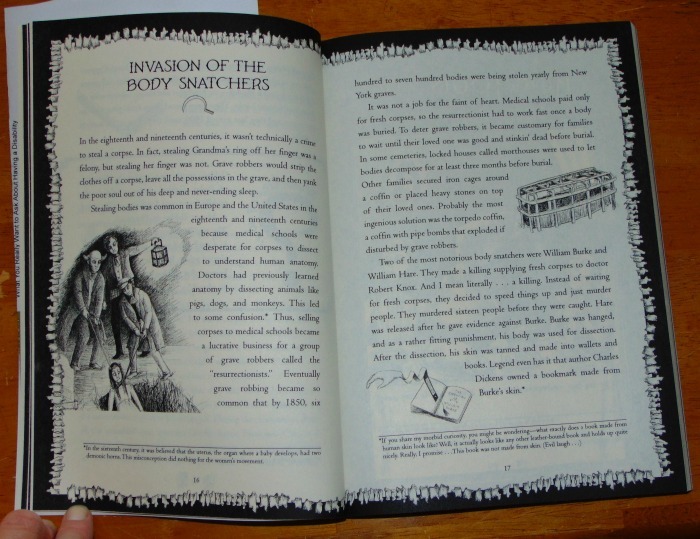 I just love all the fold outs, lift that flaps, and other treasures to be found within the pages. 🙂 It has been used! And I’ll bring it out again, but until then.. protective sleeves are good eh? Do you like mazes? 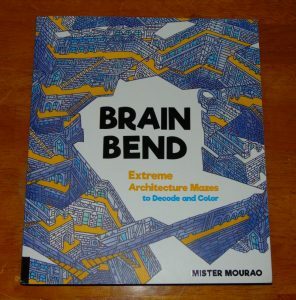 Brain Bend is a fascinating maze book, 25 of Mister Mourao’s best mazes…mazes where he plays with colour, shape and perspective. These aren’t mazes for the faint of heart…but they are intriguing. 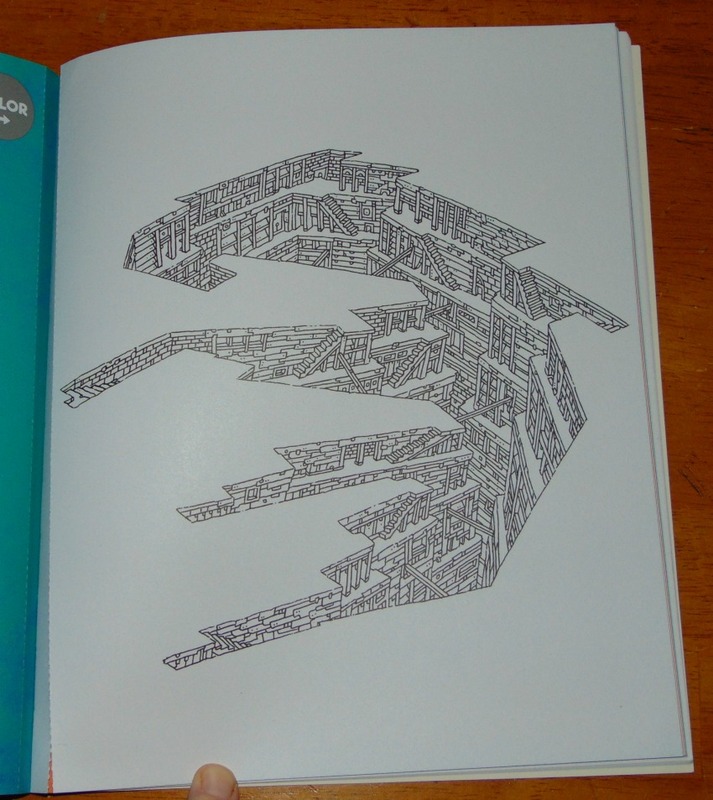 Each of the 25 mazes starts off with the maze coloured in, then you are given an uncoloured maze with the start and end points highlighted, step three is the maze uncoloured for your colouring picture. I have to admit I really liked how this book was set up. Some of the finished mazes were really well done. How the colours flowed together and the twists and turns of the mazes. I’m amazed at the skill it takes to put these mazes together. 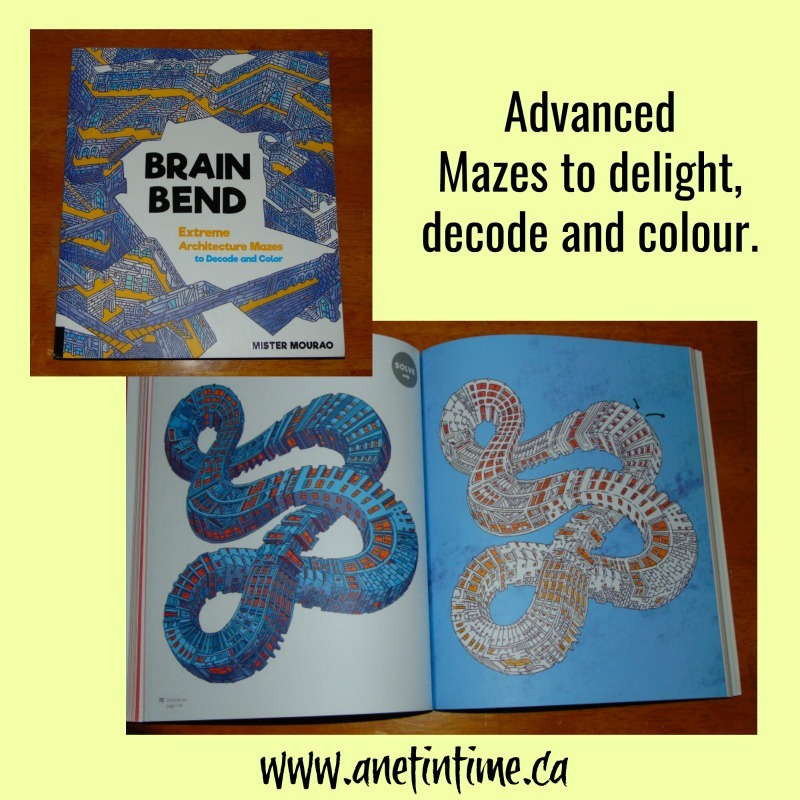 Brain Bend is a rather unique book that features 25 wild, vibrant, architecturally themed mazes. 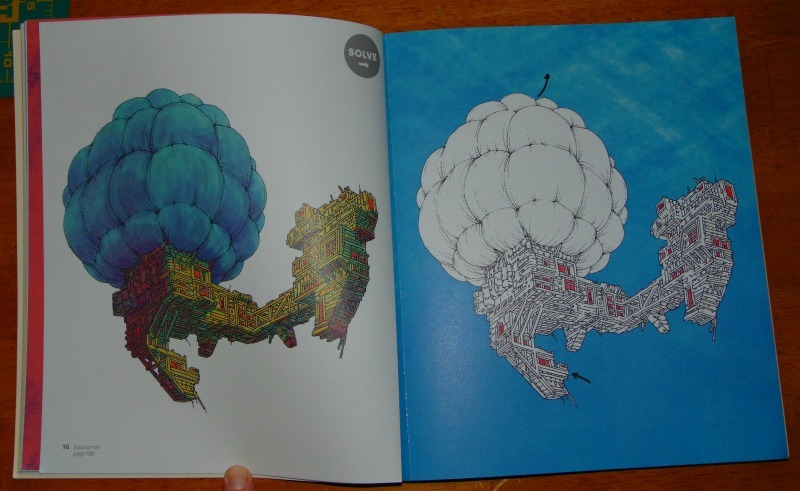 Artist and illustrator Mister Mourao created mind-bending designs. This designs ranged in style from structured to free form. They offer a challenge to stimulate your brain cells as you work to solve these mazes and then colour them in. 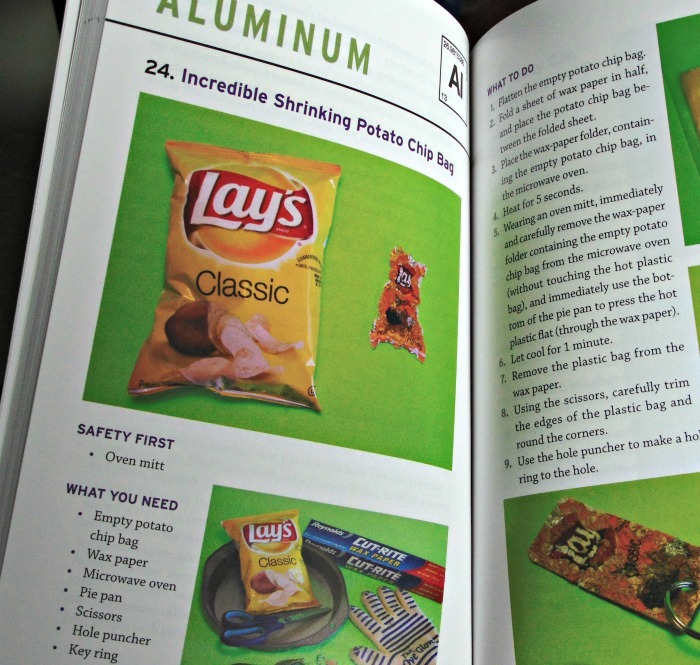 Helpful features: Maze solutions at the back of the book, and perforated pages for ease of removing pages, and heavy duty high-quality paper that prevents bleed through. 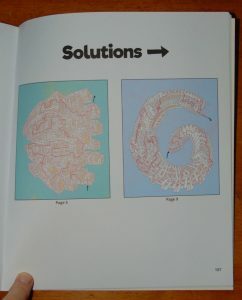 There are two oversized mazes included complete with colouring outline. Now, are the mazes easy? NO. In fact I wasn’t able to complete any of them without some peaking. I didn’t try that many, just a couple, they aren’t for the novice who wants a quick solve. BUT I do know that if I’d been inclined to take my time I could have worked them out. I’m just not that committed I guess. 🙂 IF you like challenges and like doing them via well made mazes, this book will work really well for you. 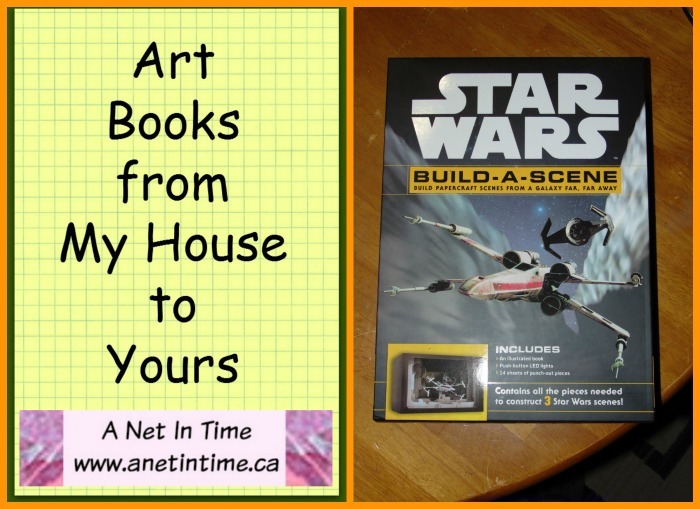 Check out what I have for you today! 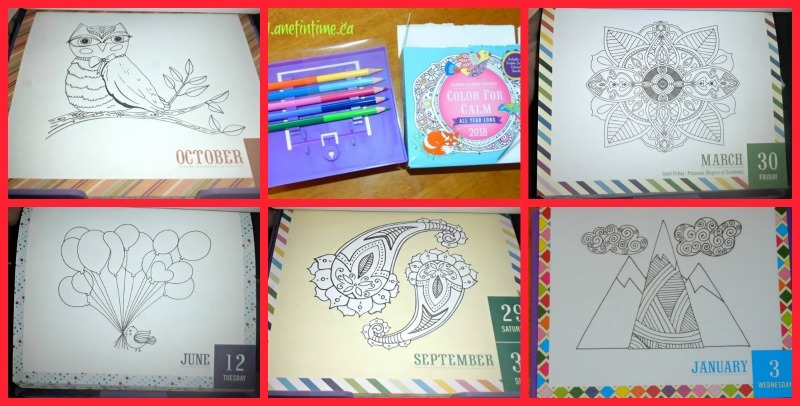 It’s a colouring calendar! How cool is that? It’s one of those daily calendars that you rip off the pages for every day of the year. 365 days of colouring. I LOVE IT! The name of this daily calendar: Color For Calm. 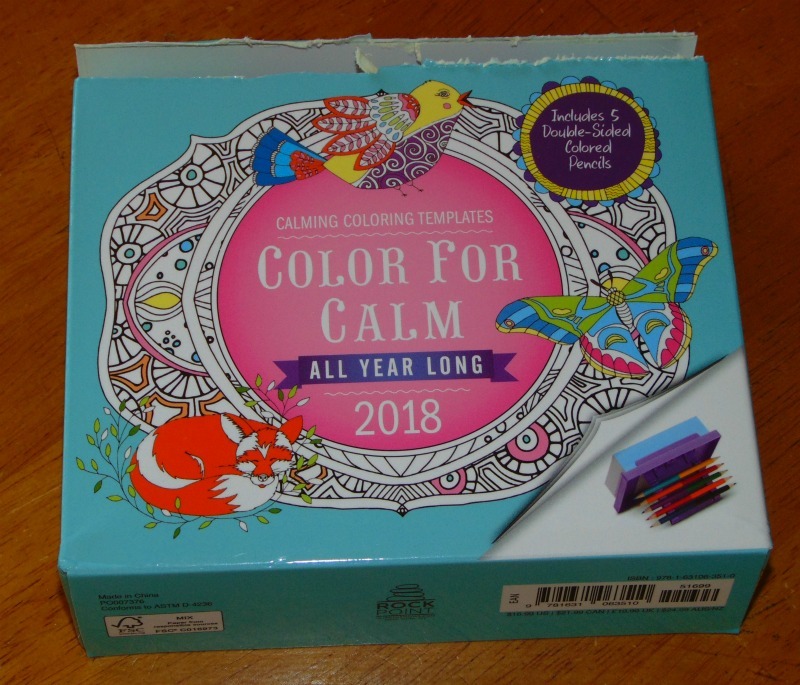 Color For Calm is a rip-off page, all year long daily calendar. Each day presents a new coloring challenge (one on weekends), a challenge that will give you few minutes to catch your second wind, to relax into the world that is colour. I noted most days were on a white background, but shared weekend dates had a faint coloured back in blue, pinks, yellows etc. Not over-whelming to affect the colour palate but just enough to show the difference. 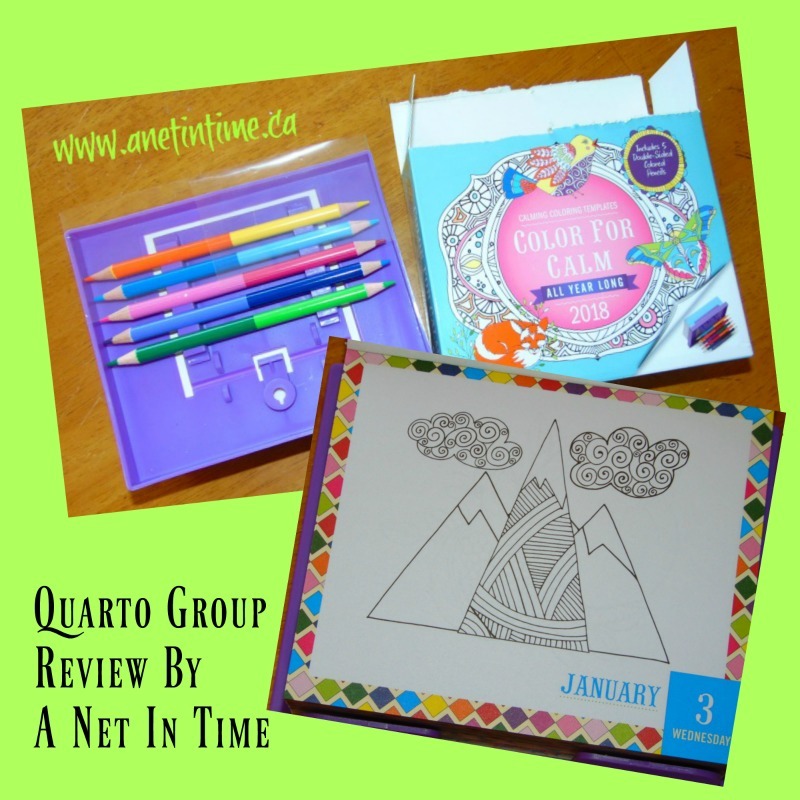 I liked all the colourful designs that framed each page. And guess what.. it even comes with it’s own colouring pencils! Five double-coloured pencil, the only thing it’s missing is the pencil sharpener. It even comes with a handy hole for hanging it on the wall. I showed this calendar to my sister and she checked through to see if it was themed, I didn’t find it to remarkably be so. In December there were Christmasy themes, but not overwhelming, October has some Hallowe’en but most fall oriented designs, similarly for the rest of the year. I would expect with any annual calendar to have something about any given holiday pertaining to that holiday. 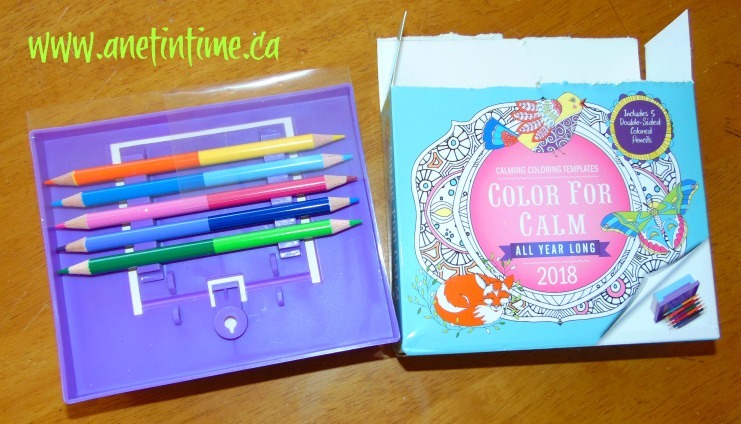 Color for Calm All Year Long 2018: Box Calendar with Colored Pencils attached to Base. You know how students of all ages can benefit from hands on learning? Today’s books guarantees it for your middle and high school students, as they work to understand the periodic table better. 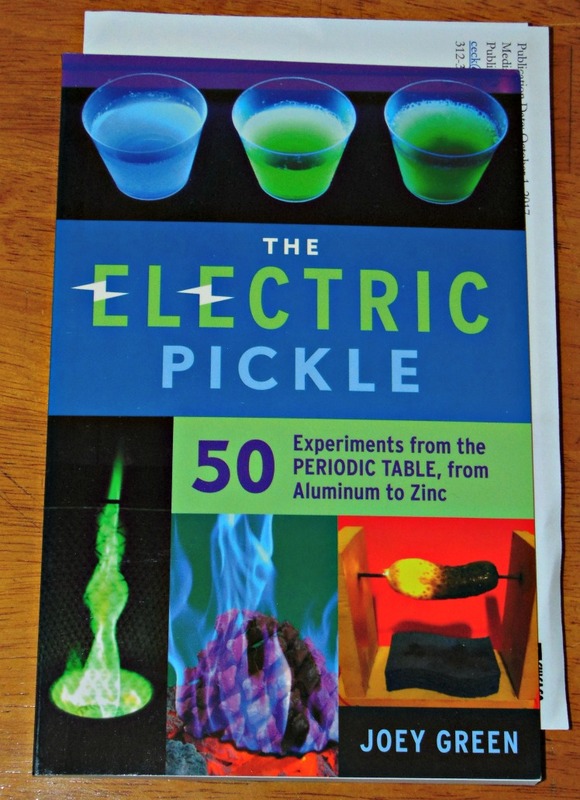 In The Electric Pickle, you will find 50 experiments on the periodic table from aluminum to zinc. As you can see, some elements have one experiment, where others will have two or more. I found the experiments used easily found household items. The full colour pictures were clear. The instruction were written in plain English. 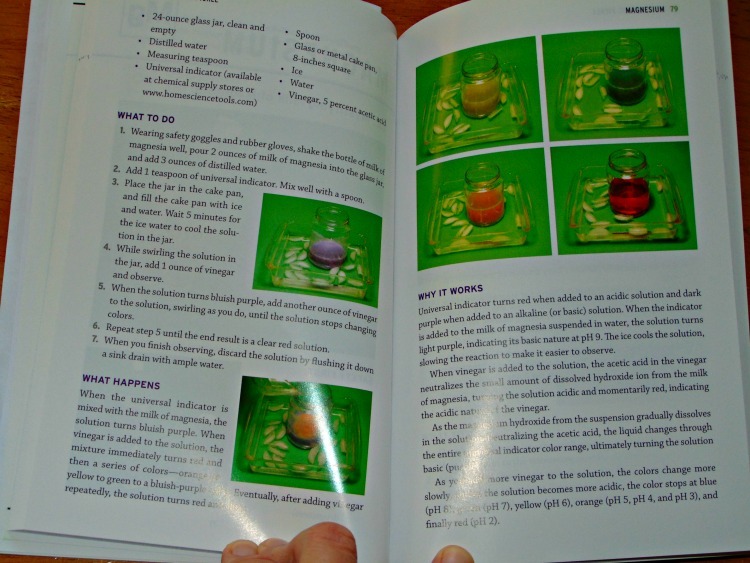 Any items that were not readily available in your household were clearly spelled out where you could probably find them, for instance not everyone will have a universal indicator so you’re told to go to a chemical supply store or to www.homeschoolsciencetools.com. Not only were you told what to do, you are also told what to expect to happen and why works. Any potentially dangerous things were highlighted in bold. I appreciated that the first time you were taught about a particular element on the periodic table, a brief explanation of that element was given. What experiments did we try? 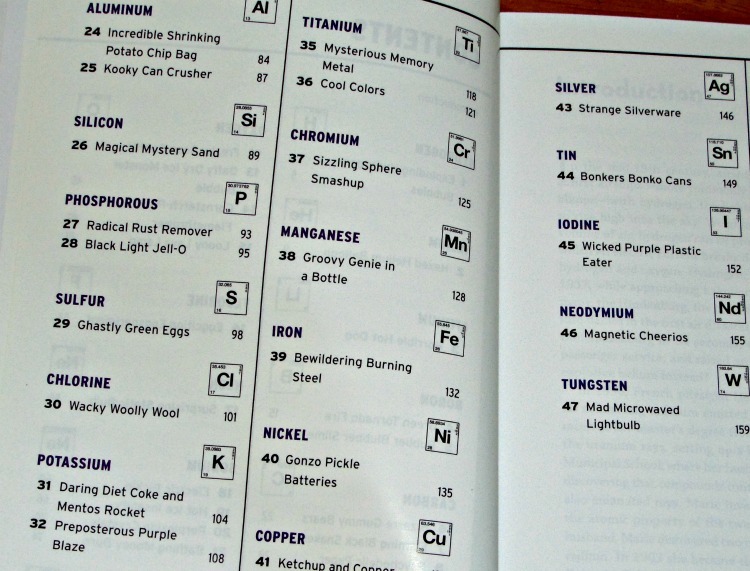 periodic table, from Aluminun to Zinc. 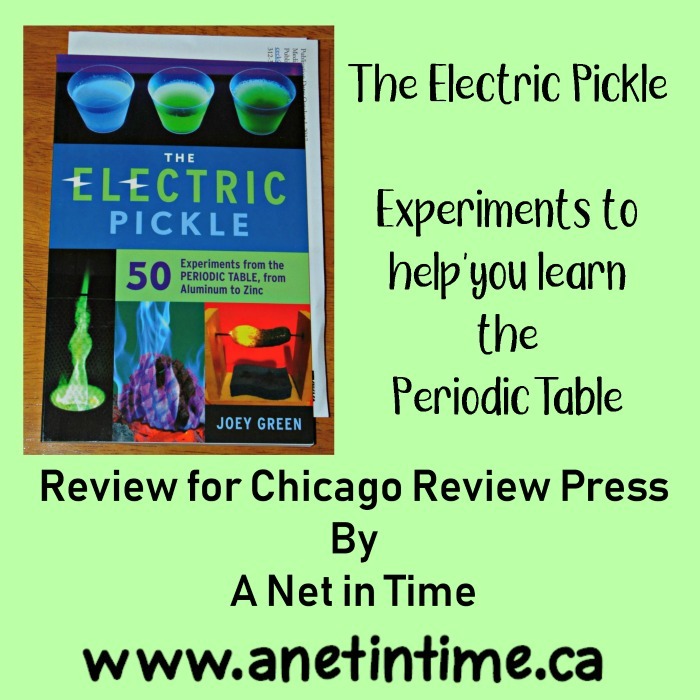 Amazon.ca:  The Electric Pickle. Amazon.com:  The Electric Pickle. I have to admit, I like this book. It is a slightly oddball way to look at history, but you know what?!?! It works! 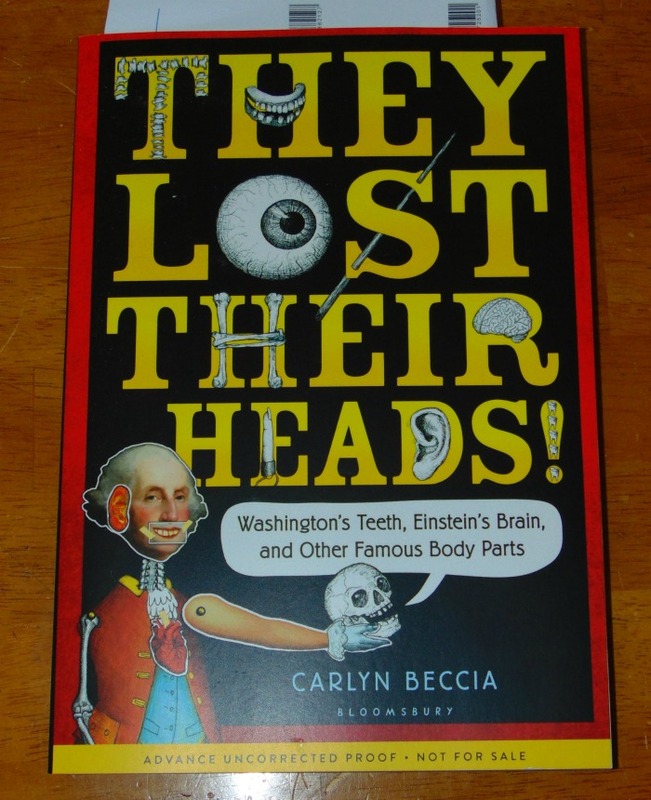 🙂 This quirky book “They Lost Their Heads!” takes a look at moments in history from 1355 through 1931 considering our human bodies. What you get is 42 different stories about famous body parts from around the world. Teeth, brains, legs, blood, ears, and so much more…. From Lincoln predicting his death and his body being moved around forever, Van Gogh and his ear, and Mata Hari with her preserved head….we are walked through various historical events from a rather unique perspective…the human body and what’s been done with it. Black and white images fill the pages. Now I received a uncorrected proof, I don’t know if ready for sale copy will have any colour added. 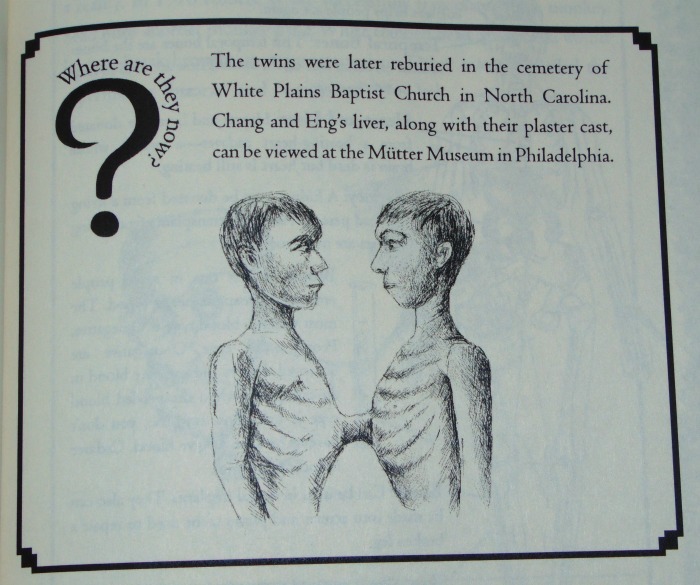 Missing corpses, fat heads, preserved brains, warts, bathing in blood, funeral mourners, body snatched and more. This book is bound to appeal to many a middle school boy, and some girls too. I know I found it to be a fun read. 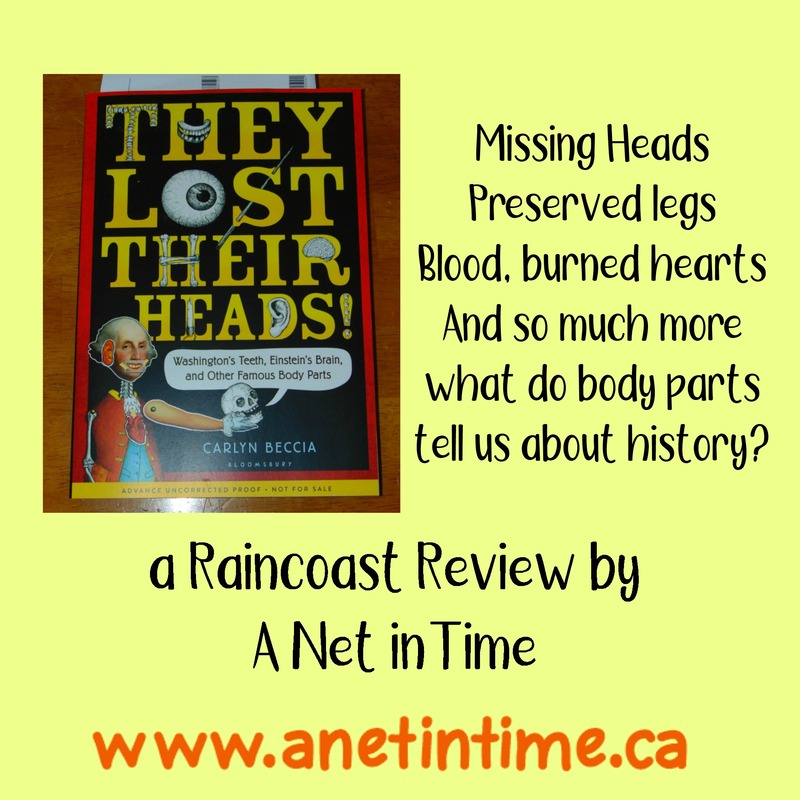 Amazon.ca: They Lost Their Heads!Amazon.com: They Lost Their Heads!